For many people, clean eating means minimally processed foods, no artificial preservatives, colors or flavors and a focus on whole foods. The movement isn’t new, but has definitely grown over the past decade. While we aren’t big fans of labeling food as good or bad (or clean or dirty in this case), we do love the whole foods focus and flavorful ingredients that don’t require a science degree to understand. It’s a back-to-basics approach to cooking and eating and we’re here for it! 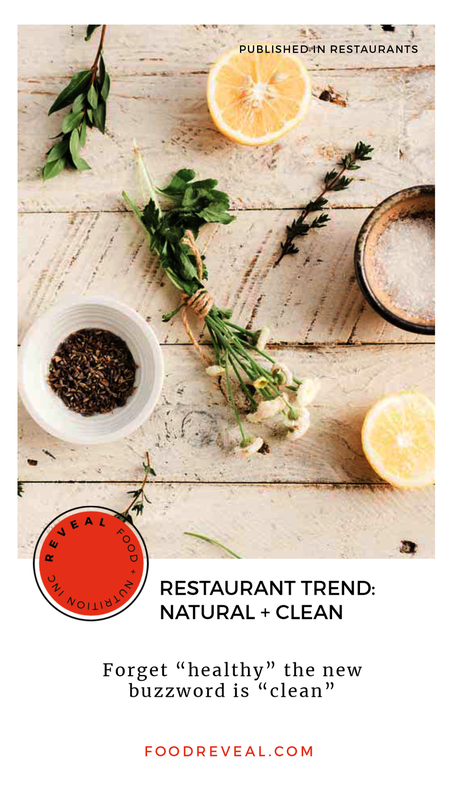 Restaurants are cleaning things up - and we’re not talking bleach and elbow grease! More chefs and culinary directors are adding simple whole foods, using more scratch-based cooking methods and sourcing products that are free from artificial ingredients. Fresh, Fresh, Fresh. Most everything on the menu is prepared from scratch. This labor of love may add a few coins to the bill, but the lack of packaged and highly processed foods in the kitchen helps eliminate excessive artificial ingredients. More whole foods = more nutrition. Yay! Food Philosophy + Transparency. Restaurants are committing to sourcing high-quality ingredients and being open and honest about what’s in the ingredients they use. The new menu labeling laws require chains to post calories on the menu - but many restaurants are going beyond that by sharing full ingredient lists and declaring which allergens are present. Open Kitchen. In the spirit of transparency - many restaurants are putting their chefs and cooks front and center. It’s easy to see how fresh the ingredients are and the scratch-cooking going into each dish. Plus, if you’re like us, maybe you’re there for the good vibes and awesome decor.